The reign of the BB cream remains undaunted, and brands are betting on them improving their formulations. 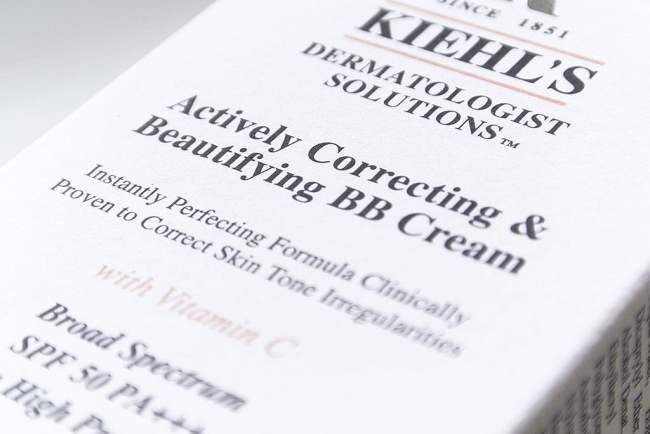 This is the case of Kiehl’s, which presents its new BB Cream Actively Correcting and Beautifying with SPF 50. The SPF quantity is more than what other BB creams offer and are more than enough to offer protection of the skin from UV radiation and damage that may involve excessive exposure. It’s also enriched with high levels of vitamin C that gets lighten the skin via decreasing melanin production, clarify skin tone and enhance radiance over time. As well, it has glycerin that absorbs moisture from the air. Furthermore, through this facial is achieved unify the tone uneven dermis itself, reducing fine lines and pores for silk skin effect. The natural mineral pigments help to provide colour coverage that will hopefully last all day except for those with oily; they might or might not see it last whole day. It’s available in 3 shades; fair, light and natural. I’ve tried quite a number of BB creams and this product feels like others i.e. a thick liquid balm. However, if truth be told it blends well once you rub it into your skin. For a BB cream, the coverage is actually pretty good i.e. around medium coverage. It covers, for the most part, minor blemishes and small discoloured spots. Although for any major coverage you’ll definitely need a concealer to layer under this product. The final texture after applying the cream on my hand was quite impressive. It was glowing but at the same time it didn’t have distinct specks with glitter. Thus the skin doesn’t look like a glisten item gone wrong. Overall, the finish is also quite natural and feels soothed and moisturized. This BB cream contains paraben, oil, silicone, and fragrance free formula. This will make it suitable for a wide range of skin types. It has multiple filters (avobenzone, homoslate, octisalate, and octocrylene) cover a good range of UVA and UVB rays. There are no mostly pore-clogging or pimple-causing compounds such isopropyl myristate. It also contains silica (silicone dioxide) as one of its ingredients which would elucidate why it would attenuate appearance of pores and fine lines. For those whose skin doesn’t react well (like irritation) to silica they should sample this product first before purchasing an actual size (it’s a bit costly). On the other hand, some people don’t fancy creams containing silica as it doesn’t work well on their skin. Kiehl’s BB cream doesn’t in point of fact contain mineral oil, or a lot of silicones. This is a good thing because silicones may not react well with certain skin types. Most of the BB creams contains significant amount of silicones. Kiehl’s BB Actively Correcting and Beautifying with SPF 50 is best suited for you those with a flawless complexion or minimal imperfections, normal to combination skin and those who are looking for a dewy finish. As well for those living in hot areas where a light coverage is just what they need.